The GDV, the federation of private insurers in Germany with about 460 members, was looking for a print management solution fulfilling special requirements regarding tab labeling. Our customized combination of Printgroove JT Compile and Printgroove JT Man won the deal. 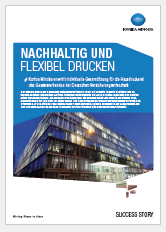 In its central print shop (CRD) the GDV mainly produces typical conference folders, meeting and training material. Especially the thematically arranged conference folders with their content separated by tab sheets are in high demand by members of the GDV. Quality: Exact color reproduction of the federation's CI is essential. Speed: Between the order of documents and the desired delivery times only a few days are left for production and delivery. Furthermore the GDV had a special requirement regarding tab labeling: The tab sheets should be labeled individually as needed, so that the unused sheets of a regular set of tab sheets would not have to be sorted out like it was done in the past. Flexibility regarding tab labeling was required as a must-have for a future print management solution. Regarding hardware the GDV has already successfully cooperated with Konica Minolta in the past. After an intensive market research, the federation has decided to continue the partnership. The use of the new digital color printing system bizhub PRESS C7000 allows to print color pages in high quality. As a result fewer orders have to be passed to external service providers. In addition two new monochrome printing systems of the type bizhub PRESS 1052 were set up. As a print management solution, the GDV opted for a customized solution that combines the two applications Printgroove JT Compile and Printgroove JT Man and allows flexible labeling of tab sheets as special feature. The individual components of the conference folders (e.g. individual PDF documents, tab sheets) are created in Printgroove JT Compile as a print project. Thanks to the adjustment made, the tab sheets do not have to be printed in the regular order, but can be addressed individually. For the management and production of print jobs the ferderation uses Printgroove JT Man. The combination of the new monochrome printing systems with the new color printing system allows the GDV, to produce print jobs fast and in perfect quality. The printing of color pages can now be handled internally, which saves costs, but also the time for the quality control afterwards. Due to the individually labeling of tab sheets, costs were reduced by half, sustainability was strengthend and the usability was increased. Read the whole Success Story at the Konica Minolta website!